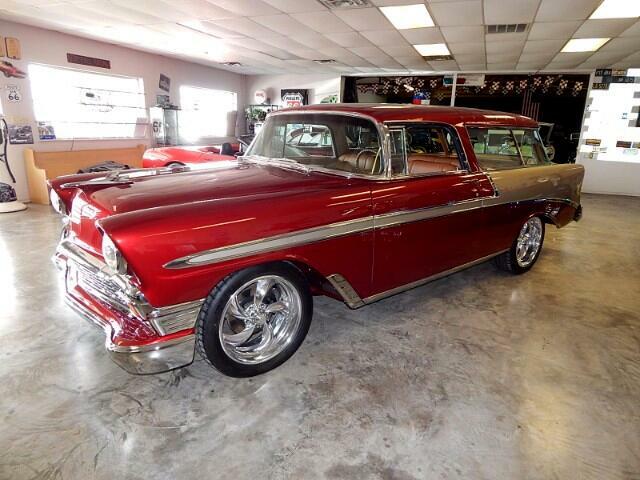 Lone Star Muscle Cars Is Proud To Present This Low Production All Custom 1956 Chevrolet Nomad. The Nomad is one of the most sought after and collected car's of all time. Here is a Short History of The Nomad. The 1954 Chevrolet Corvette Nomad was a concept car built by General Motors and introduced at the 1954 General Motors Motorama in New York City. The Nomad was decidedly a sporty wagon way ahead of its time. It was such a huge success that some of the unique features were applied to the 1955, 1956 and 1957 Nomads and early Corvettes. Chevrolet did produced about 8,500 Nomads beginning mid year 1955. Based on the sporty Bel Air series and projected almost a Cadillac image. The headlamps were slightly hooded, the grille was new, the wrap a round windshield was very fashionable, a special trail gate and the stylized slanted B pillars are what made the Nomad very popular. The Nomad was a beautifully clean design that showed a strong influence of General Motors styling engineer, Harley Earl. In 1956, the Nomad Received styling changes. The grill was bigger and wider and included a horizontal bar. Larger tail light housings. Plus the fuel filler cap was hidden behind the driver side tail lamp. Only 8,103 Nomads were built in the 1956 production year. The 1955 and 1956 Nomads are more popular today than 50 years ago. Just like the name Bel Air, the Chevy Nomad is well known and highly sought after. Here We Have A Beautiful Example Of What Time And Devotion Can Achieve. This is a Complete Nut and Bolt Frame Off Restoration From The Classic Lines Of The Nomad To This Full Turn Key Restomod. Under The Hood You Will Find A 6.0 LS 2 Motor With The 4L60 Four Speed Automatic Transmission,Power Steering, Power Front Disc Brakes,Vintage Heat And Air System,Large Cooling System. Curry 9" Rear End With 3:73 Ratio. The Firewall has been shaved and customized to accommodate the LS-2 for a show quality look. All The Front Suspension has been upgraded for a smoother ride and comfort. This was not only built to show off but also cruise. The builder wanted a one of a kind classic that drove as well as she looks and this is the end result. On The inside you will see a very customized interior. Starting With The 1959 Impala Dash That looks so good it should have come from the factory. Custom Classic Industries Gauges Custom Sound System Flaming River Tilt Steering Wheel, Power Front Windows, LED Overhead Lighting and one of the nicest all Leather Interiors From the Seat's To The headliner and custom consul All In Very tasteful Medium Brown Hide. When this car was taken to the interior shop Chuck Rowland Put his special touches on this one. On the outside you will see what thousands of hours and dollars will be the end result. Ultra nice show quality paint every time you see this car you will notice something new and custom . sitting on 18" American Racing Custom Wheels and so much more call for more information. Message: Thought you might be interested in this 1956 Chevrolet Nomad.